Click here for chart of resolutions of UNGA 69th Session. Yet according to new data released today exclusively by UN Watch, the UN General Assembly this year has continued to demonize Israel, subjecting it to 20 condemnatory resolutions, compared to only three on the rest of the world combined, being one each on Iran, Syria and North Korea. French Prime Minister Manuel Valls said last week, in a special address to the National Assembly in Paris, that a new anti-Semitism has arisen in the world which, based in part on the “loathing of the State of Israel,” advocates hatred of Jews. UN General Assembly, Sixty-ninth session: An informal meeting of the plenary to address concerns of a rise in anti-semitic violence worldwide, will be held on Thursday, 22 January 2015. A letter from the President of the General Assembly, dated 12 November 2014, was sent to all permanent representatives and permanent observers. While Human Rights Watch director Ken Roth has emerged this week as the most prominent backer of the PLO’s controversial new bid to join the International Criminal Court in order to launch criminal complaints against Israel, it was not so long ago that Roth’s organization promised Americans that precisely this scenario would never happen. The flip-flop seriously undermines Roth’s credibility on the subject of the ICC, and will only strengthen the cause of the court’s skeptics in the United States. Now trending on BuzzFeed: The past year’s most compelling, dramatic and impactful moments in UN Watch’s battle against dictatorships and double standards, in defense of the true principles of human rights. Can you guess which was the No. 1 biggest UN Watch moment of 2014? Click here for the BuzzFeed full list. For only the third time in history, the States Parties to the Geneva Conventions met yesterday to condemn a country for violating the law of war. As on the previous two occasions, the country condemned was Israel. After the Holocaust, the world gathered in Geneva to affirm the laws of war and enshrine the prohibition against targeting civilians. One of the early champions of activating these legal conventions for the first time to single out Israel — while ignoring war crimes by Saddam, Qaddafi, and Arafat — was law professor William Schabas, who now chairs the UNHRC’s Commission of Inquiry on Gaza. In 1999, before the International Criminal Court was even in operation, Schabas was an early campaigner for the indictment of Israeli leaders. At a June 1999 Cairo meeting of the UN’s “Committee on the Exercise of the Inalienable Rights of the Palestinian People,” Schabas embraced an extraordinary session on Israel — the first time the treaty was enforced against any state or non-state actor — to be held by the High Contracting Parties to the Fourth Geneva Convention. Speaking before opponents of Israel gathered from around the world, Schabas told the Cairo forum that member states were “under an obligation to prosecute” Israelis “suspected of committing grave breaches.” States are required to seek extradition of those whom Israel refuses to try, said Schabas. At a time when Islamic extremists are slaughtering men, women and children from Nigeria to Syria to Pakistan, and when Russia has swallowed Crimea and plunged eastern Ukraine into war, killing 4,700 and wounding 10,000 more, the world yesterday decided, as it did in 1999 and in 2001, to single out Israel alone for censure. There was no condemnation of Hamas for firing thousands of rockets at Israeli civilians, or of PA Chairman Mahmoud Abbas for inciting murderous terrorist attacks on the streets of Jerusalem, and against worshippers in a synagogue, all in gross breach of the Geneva Conventions, which the Palestinians signed earlier this year. 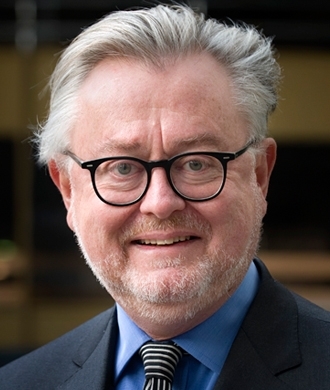 Schabas is scheduled to present his report before the UN Human Rights Council in March 2015. Legally, however, he is obliged to recuse himself on account of his prior statements and actions which objectively create the appearance of bias. We are shocked by UNRWA’s call to boycott one of Israel’s oldest newspapers and appeal to you to speak out and hold the organization to account. With the U.S. being the largest donor to UNRWA—giving $398 million this year alone—your clear voice on this matter can play a vital role in upholding the principles of the UN Charter. Barely has the ink dried on the 2015 UNRWA-U.S. Framework for Cooperation—in which Commissioner-General Pierre Krahenbuhl solemnly promised that UNRWA would respect impartiality—and its top spokesman Chris Gunness, tweeting on Thursday from his official account, called to “Boycott the Jerusalem Post!” The statement remains there and has not been renounced in any way by UNRWA, nor by the DC-based representatives of UNRWA USA whom we approached on this matter. What so outraged Mr. Gunness was an op-ed by Palestinian human rights activist Bassam Eid that called for an audit of all allocated funds to UNRWA and the dismissal of its Hamas-affiliated employees. (“Proud Palestinians must lead the fight to reform UNRWA,” Dec. 1, 2014.) Rather than respond rationally, UNRWA lashed out. Never before has a UN humanitarian organization called to boycott a newspaper. Mr. Gunness is a repeat offender. In July, to name one of numerous examples, he urged reporters to interview Dr. Mads Gilbert, a pro-Hamas Norwegian activist who in September 2001 supported the “moral right” of Al Qaeda to perpetrate the 9/11 terrorist attacks. Mr. Gunness is flagrantly abusing his humanitarian mandate for political advocacy. If you don’t hold him and UNRWA to account, I fear, no one will. This morning, the Human Rights Council elected its President and four Vice-Presidents for the year 2015. What was also interesting was that we have geared up for new reform process for the Council, ahead of its 10 year anniversary in 2016. Germany was chosen from the WEOG group to be the Council’s President for 2015, while Albania, Botswana, Kazakhstan and Paraguay were chosen as Vice-Presidents, representing the other regions. The Council has no scheduled reform up ahead, other than the GA to consider the status of the Council (subsidiary to the GA or on an equal level as a principal body) “at an appropriate moment and at a time no sooner than ten years and no later than fifteen years.” Yet, today’s organization meeting may have kicked off a new round of reforms for the HRC, which still has not been able to full implement its mandate and efficiently assist human rights victims around the world. Ambassador Joachim Rucker of Germany, the HRC’s President-elect, went a step further and proposed a first round of informal discussions in Berlin, on May 21-23, on the role of the Council and how to further improve its efficiency and effectiveness. The reform process for the HRC in 2016 has been officially inaugurated. UN Watch will of course be present throughout this process and advocate for what is right. GENEVA, December 5 – A U.N. watchdog group is urging Secretary-General Ban Ki-moon and U.S. Ambassador Samantha Power to investigate UNRWA for breaching its recently-signed commitment to the U.S. on neutrality, after the billion-dollar relief agency’s top spokesman called for a boycott of Israel’s largest English-language newspaper. The International Criminal Court is examining the U.S. for possible war crimes committed in Afghanistan, a move that some experts believe is unjustified and could undermine the tribunal’s work. The court is now at the stage of weighing the gravity of the alleged U.S. war crimes, and whether America’s own system of investigations and willingness to prosecute (“national proceedings”) are genuine. 94. The Office has been assessing available information relating to the alleged abuse of detainees by international forces within the temporal jurisdiction of the Court. In particular, the alleged torture or ill-treatment of conflict-related detainees by US armed forces in Afghanistan in the period 2003-2008 forms another potential case identified by the Office. In accordance with the Presidential Directive of 7 February 2002, Taliban detainees were denied the status of prisoner of war under article 4 of the Third Geneva Convention but were required to be treated humanely. In this context, the information available suggests that between May 2003 and June 2004, members of the US military in Afghanistan used so-called “enhanced interrogation techniques” against conflict-related detainees in an effort to improve the level of actionable intelligence obtained from interrogations. The development and implementation of such techniques is documented inter alia in declassified US Government documents released to the public, including Department of Defense reports as well as the US Senate Armed Services Committee’s inquiry. These reports describe interrogation techniques approved for use as including food deprivation, deprivation of clothing, environmental manipulation, sleep adjustment, use of individual fears, use of stress positions, sensory deprivation (deprivation of light and sound), and sensory overstimulation. 95. Certain of the enhanced interrogation techniques apparently approved by US senior commanders in Afghanistan in the period from February 2003 through June 2004, could, depending on the severity and duration of their use, amount to cruel treatment, torture or outrages upon personal dignity as defined under international jurisprudence. In addition, there is information available that interrogators allegedly committed abuses that were outside the scope of any approved techniques, such as severe beating, especially beating on the soles of the feet, suspension by the wrists, and threats to shoot or kill. 96. While continuing to assess the seriousness and reliability of such allegations, the Office is analysing the relevance and genuineness of national proceedings by the competent national authorities for the alleged conduct described above as well as the gravity of the alleged crimes. 102. The Office will continue to analyse allegations of crimes committed in Afghanistan, and to assess the admissibility of the potential cases identified above in order to reach a decision on whether to seek authorization from the Pre-Trial Chamber to open an investigation of the situation in Afghanistan pursuant to article 15(3) of the Statute. Many contentious issues were raised at the examination of the United States by the UN Committee Against Torture (CAT) on November 13–14, as rapporteurs and committee members considered the United States adherence to the said convention. Ambassador Keith Harper, the US representative to United Nations Human Rights Council initiated the US presentation by explaining how torture violates human rights and US law. Harper continued, that while under the Bush administration boundaries had been crossed, President Obama had made great strides to ensure that no form of torture, or violation of human rights would occur on US soil. Similarly, neither would the US transfer a detainee to a location in which there was the possibility of them experiencing inappropriate treatment. David Bitcall, deputy assistant of the criminal department of the Department of Justice explained that there was rigorous restructuring and reform to ensure that police officers as well as soldiers alike conducted themselves according to the army manual and discrepancies would be and were frequently punished. For example, over the past 5 years, 330 police officers have been reprimanded for misconduct on the job and this reform is only increasing. Bitcall further explained the rational regarding why the US do not use any forms of torture, which he concluded, was an ineffective tactic used to gain information. A sample of the lawyers and human rights activist who have questioned the tenure of William Schabas as chair of the UN commission of inquiry on Gaza, in light of his prior prejudicial statements. Thank you for your open letter signed by 20 North Korean defectors of September, 19, 2014 regarding the human rights situation in the Democratic People’s Republic of Korea and in particular regarding your request to Switzerland to immediately freeze all assets of the North Korean leadership within its territory. As you know, the universal protection and promotion of human rights are a top priority of Swiss foreign policy provided for by the Federal Constitution. Hence, human rights issues are incorporated into its overall foreign policy and are regularly addressed at governmental level and in multilateral forums. The serious and systematic violations of human rights and crimes against humanity that are being committed on a large scale in the Democratic People’s Republic of Korea — as established by the Commission of Inquiry on human rights in the Democratic People’s Republic of Korea in its detailed, well-documented and comprehensive findings — are a source of grave concern to Switzerland. As stated in the open letter, these serious violations of human rights need to be treated with the greatest urgency. Therefore, Switzerland supports in particular the Commission’s recommendation to refer this situation to the International Criminal Court. The situation in the Democratic People’s Republic of Korea already led Switzerland to take action, including legal steps. On 25 October 2006, the Confederation enacted a range of coercive measures in order to implement sanctions that had been ordered by the United Nations Security Council: the Ordinance instituting Measures against the Democratic People’s Republic of Korea entails a list of 12 individuals and 20 organisations that are subject to such coercive measures, including a freeze of their assets. Regarding coercive measures, resolute and concerted action at the United Nations are key to improve the situation and Switzerland stands ready to adapt its own legal measures should new developments take place at the Security Council. Switzerland will also continue to express its grave concern related to the human rights situation in the Democratic People’s Republic of Korea within the framework of its bilateral relations with the Democratic People’s Republic of Korea, such as during the political dialogue which will take place in November 2014, and will continue to be actively engaged regarding efforts in the UN General Assembly and in the Human Rights Council to improve the situation in the Democratic People’s Republic of Korea. With a little help from his 275 staff members, Human Rights Watch director Ken Roth voices moral outrage on his Twitter feed once every hour, 24 times a day, seven days a week. Iran’s representative just told the UN Human Rights Council that the West and its “media blitz” and “propaganda” is the real one to blame for its execution on Saturday of 26-year-old Reyhaneh Jabbari. One issue was about a recent execution. Let me explain. 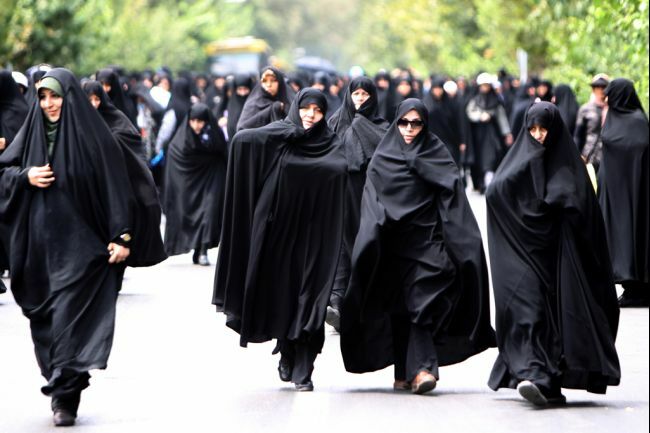 Reyhaneh Jabbari had numerous judges, numerous lawyers. The lawyers defended her. Court came back with an indictment that it was first degree murder with intention, with capital punishment. So this execution went ahead. We’re very sorry that two nationals lost their life. Western countries should look into it. This idea of “the West and the rest, only the west has good things,” this is wrong. Please accept the idea that others have a good way of life. Westrn lifestyle isn’t only way of doing things. Mr. President, I am speaking to you on behalf of UN Watch. Standing before you is Father Gabriel Naddaf, a Christian citizen from Nazareth, the city in which Christ was raised and where he proselytized. Dear Sirs, while I stand before you today, the earth of the Middle East is soaked with the blood of Christians being killed daily. Last week, at the 2014 Oslo Freedom Forum, the annual meeting of human rights and democracy activists from around the world, Bård Glad Pedersen, Norway’s State Secretary for Foreign Affairs, had very strong words in support of human rights defenders and against dictatorships. He pointed out how autocratic regimes coordinate at the UN to undermine human rights, something that also hurts confidence in the UN, as he said. Below is this rare excerpt coming from a European democracy, admitting the sad reality of the UN Human Rights Council which UN Watch consistently fights to expose. We need to defend those who bravely stand up to protect human rights. We must show that the world is watching. We advocate the importance of protection of human rights defenders in the UN. We support the UN Special Rapporteur on human rights defenders. We support individuals, organizations and networks that are promoting human rights for all. We support security training and capacity building but I think we can do more and we must do more. The fundamentals for protecting and promoting human rights are largely in place today. However, the gap between commitment on one hand and reality on the ground on the other hand is unacceptable. I think it is important that we recognize that the international system to promote and protect human rights is not equipped to address all these challenges fully and adequately. In the UN, states with bad human rights records are actively working to undermine human rights and they are building alliances among themselves. This threatens human rights and also confidence in the UN. The answer is not to cave in, the answer is to respond forcefully. I believe it is even more important that we, we who believe in human rights, are active, committed and visible within the system and that we actively advocate the right of civil society to be heard in these forums. To promote human rights, we must work multilaterally in the UN and must work to strengthen the system. We must work regionally through the Council of Europe and support similar institutions in other regions of the world. We must work bilaterally, address issues, share concerns and build alliances across geographies. The most rewarding and perhaps important part of my job is to meet human rights defenders. Sometimes part of the importance is that it is visible for totalitarian regimes that we meet. Other times, I am asked not to talk about the meetings because it would increase risks for the brave people who share their stories. The meetings are valuable because it gives insight and inspiration to continue also our efforts. Your strong voices and bravery makes a powerful impression. Many contentious issues were raised regarding Israel’s human rights record on October 20, as the UN Human Rights Committee considered Israel’s implementation of the International Covenant on Civil and Political Rights. In presenting the report, the Israeli delegation noted that despite constant security challenges, Israel had taken significant steps in the implementation of the Covenant. Operation “Protective Edge” was further acknowledged with mention of Hamas’s actions necessitating a military response. Nevertheless, “Israel remained committed to the realization of a peaceful future and was willing to make painful compromises to see the creation of a demilitarized Palestinian state living side-by-side with the Jewish State of Israel,” said Eviator Manor, Israel’s Ambassador to the United Nations in Geneva. Further, the promotion of Israeli civil and political rights were examined with emphasis placed on initiatives aimed to advance the Arab population living within Israel. These included the Ministries of Justice and Foreign Affairs initiative to enhance cooperation between State authorities, scholars and civil society organizations in the reporting process and in the implementation of human rights conventions; in conjunction with the establishment of a joint inter-ministerial team which primarily functions to review the concluding observations of the human rights committees. term as a non-permanent member of the United Nations Security Council on Thursday. GENEVA, October 16, 2014 – Despite Venezuela’s record of human rights abuses against judges, students and peaceful protesters, and its backing of Syria’s Assad regime, a majority of EU member states today were among the 181 states that voted Venezuela onto the UN Security Council, drawing the ire of human rights activists. “It’s an outrage that at least 16 of 28 EU states today empowered and legitimized a repressive government that openly sides with the murderous Syrian regime,” said Hillel Neuer, Executive Director of the Geneva-based UN Watch, an independent human rights group which recently brought Venezuelan human rights victims to testify before the world body. The State of Palestine expressed its disappointment at Israel’s decision not to participate in this agenda item of the Council. The occupation and numerous human rights violations by Israel for the last 47 years made Israel the world’s biggest violator of human rights. United Arab Emirates for the Arab Group expressed extreme discontent about the European Union’s decision to boycott this agenda item.
.@KenRoth You praised PA for signing int’l covs; so why u & @HRW colleague @sarahleah1 silent as PA gov partner fires rockets at civilians? April: Pal'ns sign Geneva Conventions –> cheered by @UN_HRC @amnesty & @HRW's @KenRoth. Now: they fire rockets at civilians –> #silence. #Israel partisan diversionary tactic of pointing out that someone else is worse doesn't justify Israel's violating law protecting civilians. If anyone can identify any meaningful difference now between Hamas' social media feed and that of HRW director @kenroth, please let me know. People accept @HRW reporting as fair & accurate around globe but when it comes to poor, helpless, defenseless #Israel we're suddenly biased. Interesting: Hamas rocket kills Bedouin Arab —> @KenRoth blames Israel. Hi @KenRoth, Lovely to debate your chap Bill on Al Jazeera. 1st he said Hamas terror tunnels = a “slogan.” Then he said it, too. Progress! New record of ignominy: in space of 90 minutes, @KenRoth just posted #twice that Hamas "never uses human shields.” Says: “Show me evidence"
UN rights council recently launched investigations for Syria, SriLanka & NKorea but when it does for Gaza (both sides) it's accused of bias.
.@KenRoth @GerardAraud No, Ken. US vetoes resolutions for the US. It's a tool, used for good to counter bias, for ill to shield villains. Should Israel or Hamas go to war? @HRW takes no position, but we insist that if at war both sides respect Geneva Conventions. Neither is. To those asking what I'd do if Hamas were firing at me, my response: I'd carefully target only combatants, not recklessly kill civilians. When Hamas-Israel war ends, @kenroth will still have his hourly ghost-written tweets on global killings—but nothing to personally obsess on.
.@KenRoth Are you so busy defending Hamas' right to kidnap Israeli soldiers that you've 0 to say on THIRD Hamas rocket cache @UNRWA school?
. @KenRoth just blamed #Israel for 'juvenile' tweets by random supporters. Is there ONE example of him blaming #PLO, #Hamas, #Iran for same? @billy_richling @KenRoth What do you mean? He said he judged Israel's conduct by the "juvenile nature of many Twitter replies."
. @KenRoth But you lobbied 4 Islamic bloc's UN res that condemns Israel 18 times and Hamas 0 times. So your "I'm balanced" pose fools no one. 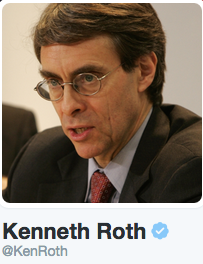 HRW director @KenRoth’s support for Hamas is no justification for Egypt to deny him entry. No, @Marianhouk, it's no joke. I repeat: @HRW director @KenRoth’s support for #Hamas is no justification for #Egypt to deny him entry.
.@KenRoth’s renewed support for Hamas war effort, via bid to deny Israel defense, doesn’t justify his deportation out of Egypt on Monday. Six Ways Hamas Could Limit Civilian Casualties in Gaza: http://t.co/SAKS7JSlex During the war, why did #HRW's @KenRoth never publish this?
. @KenRoth You may have $228 million in bank, but I'm not scared of you. Your Israel mania draws you to back Hamas, enemy of human rights. Dear @KenRoth, Why as head of a rights org do you go out of your way to justify the acts of a murderous, misogynistic & anti-gay terror org?
. @KenRoth We know, Ken, but you're dodging the question: Why is a human rights activist going out of his way to legitimize Hamas attacks? MEMO ——— FROM: @KenRoth TO: V. Putin As head of Human Rights Watch, I just wanted you to know that Int'l Hum'n Law allows aggression.
.@KenRoth But the real issue, which you continue to dodge, is why you go out of your way to publish “IHL allows” tweets to support #Hamas.
.@KenRoth And unlike your relentless “IHL allows” dispensations for Hamas tunnels + kidnapping, we haven’t seen any of same for IDF defense. Inappropriate for @KenRoth to tweet on James Foley same time he tweets legal OKs for methods of Islamist terrorists now targeting civilians. Now: #Hamas attack wounds 3 Israeli Arabs who were driving Gazans to Israel for medical care. I urge @HRW's @KenRoth: Stop justifying Hamas. Despite what @KenRoth says, human rights activists should condemn Putin's invasion of Ukraine in violation of the UN Charter & Rome Statute. Hillel, below I have attached additional compilations of quotes supporting Ken Roth’s evident bias . GENEVA, September 30 – A top figure in the human rights world has called for William Schabas to “recuse himself” from the new UN probe on Gaza, undermining Schabas’ claim that the only people who believe he should go are critics of the UN. The statement was made last week by Aryeh Neier, founding director of Human Rights Watch, former head of the ACLU, and President Emeritus of George Soros’ Open Society Foundation, and revealed today in a Wall Street Journal interview with UN Watch executive director Hillel Neuer. In a lecture at the SciencesPo Paris School of International Affairs, where Neier teaches together with Schabas, the former said that commissions of inquiry are one of the few good things to come out of the UN Human Rights Council. Schabas’ appointment gives Israel a perfect excuse to denounce the UN commission of inquiry, said Neier. “Why make it so easy for Israel to do so?” he asked. The revelation comes one day after a similar call by Mordechai Kremnitzer, a top Israeli legal scholar who serves on the Public Council of the human rights group B’Tselem. The United Nations has airbrushed George Clooney’s wife out of its history books, as a new report by the world body eliminates all mention of its ill-fated appointment of Ms. Amal Alamuddin last month as a member of its commission of inquiry on the Gaza conflict. The U.N.’s August 11th announcement that the Hollywood star’s then-fiancee would serve on the probe made world headlines. Only hours later, however — possibly due to the immediate controversy that erupted over the the inquiry’s chair, William Schabas — Alamuddin abruptly withdrew. UN Watch was the first to question the impartiality of Schabas due to his many prior statements calling to indict Israeli Prime Minister Benjamin Netanyahu for alleged war crimes. Alamuddin’s withdrawal was a significant embarrassment for the UN, which quickly replaced her with another woman, as the Palestinian ambassador said would happen. On 11 and 25 August 2014, the President of the Human Rights Council appointed William Schabas (Canada) as Chair, Doudou Diène (Senegal) and Mary McGowan Davis (United States of America) to serve as members on the Commission of Inquiry. When the UN Human Rights Council presented a report that was 90 percent full of false praise for Qatar’s human rights record — from the likes of China, Iran and Turkey — UN Watch took the floor and called them out. UN Watch articulated objections from Qatar’s migrant workers, women, and other victims, yet the chair said “I see no objection,” and adopted the report. An extraordinary event took place at the Human Rights Council on September 16, when the Palestinian representative took the floor to attack countries for attacking Israel. The incident took place while the HRC was discussing human rights situations around the world, under Agenda Item 4. Israel is the only country singled out by a special agenda item. Not even Syria, Sudan or North Korea have their own agenda item. Under that biased framework, Israel is attacked by venomous accusations, and targeted under more than half of the HRC’s country resolutions. Even UN chief Ban Ki-moon has condemned the institution of this agenda item. In the past year, the EU has refused to take the floor under Agenda Item 7, denying it legitimacy. Instead, they speak about Israel, when they feel the need, under Item 4. Gradually, Item 7 threatens to become a dead letter. This triggered an angry response from the Palestinian representative who criticized these democracies — and also challenged Israel’s right to self-defense against Hamas terrorism. Of course, the Palestinians did not object to Iran criticizing Israel under item 4, or other authoritarian countries who are willing to do so at every opportunity. Today we ask: Does the cause of human rights support — or object — to the adoption of today’s UN Human Rights Council report on Qatar’s human rights record? No less than 78 out of the 84 country statements in this report offer praise for the human rights record of Qatar. That’s over 90 percent. The truth is that the 1.4 million migrant workers in Qatar object to this report because they are dying at the rate of one a day from inhuman conditions. At the current pace, more than 4,000 migrant workers will die to build the infrastructure for Qatar’s 2022 World Cup. For all of these reasons, let me be clear: the victims of human rights abuse around the world object to the adoption of this report. President of UNHRC Session: May I now propose that the Council adopt the decision of the UPR on Qatar as appears on screen. I see no objection. The decision is adopted.